Most tax and accounting professionals are not well-acquainted with our oddball lifestyle. You’ll want to work with a knowledgeable numbers and tax law guru who understands the intricacies of tax filing for full-time RVers. Ask around on full-time RVing discussion forums and groups, you’re likely to find a professional who can keep you as far away from the audit trail as possible. We hunted around and found George Montgomery, a former full-time RVer, business man and enrolled agent for the IRS. He wrote a book called “Can I Write Off My RV? What Every RVer Should Know About Taxes” which is a great place to start your full-time RVing tax picture research, even if you don’t choose him as your tax preparer. George’s book will put a stop to the myths you’ve probably heard about writing off #recreational vehicle expenses. After living and working on the road as a tax man, George is so qualified he’s earned the title of “RV Taxmaster” from Workamper News. One of the most interesting things I learned from George’s book is that if a full-time RVer has no primary residence other than their RV, none of the lodging portion can be written off, but some deductions can be taken if the RV is being used for business. What a surprise to learn that this is completely opposite of the way I always understood the “sticks and bricks” home office deduction, which my husband and I have always taken advantage of since we became self-employed in the 1990s. But wait: before you call H&R Block, if you’re a full-time RVer who lives and works or volunteers on the road, you want to make sure you get the right person to file your tax paperwork. Don’t be fooled into thinking that deducting expenses for your full-timing lifestyle is the same as when you lived in a stick house. 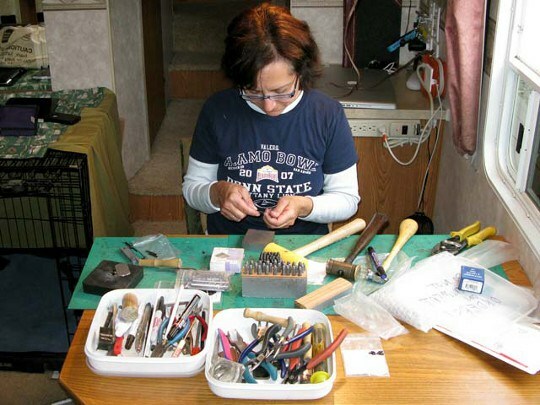 Living and working from your RV paints a very different tax picture, so before you try to write off your RV payment and associated costs as a “small business” expense, take a minute to learn more about how the tax laws affect – and benefit – you as a full-time RVer.